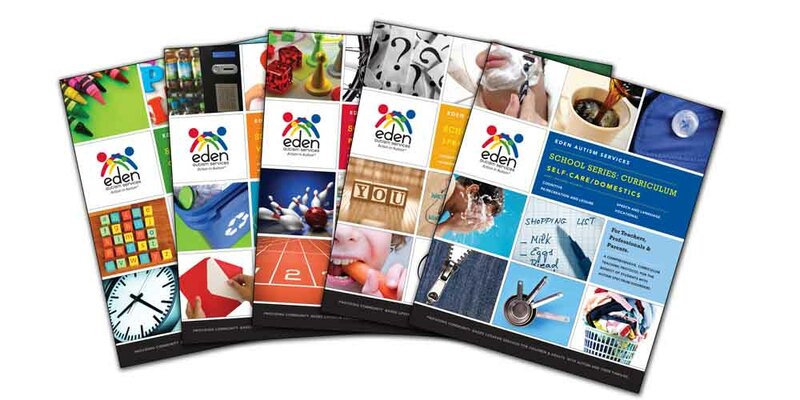 The Eden School Series Curriculum provides an expansive range of content for grades Pre-K through 12. It also includes an Assessment module that integrates seamlessly with the Curriculum, making it easy to translate the assessment into concrete IEP goals. The Eden Autism Assessment provides educators and therapists with a tool that allows for the accurate assessment of a student’s current abilities and skill levels. This assessment identifies a student’s strengths and weaknesses, assists with goal selection, tracks progress, and makes it easy to translate the assessment into concrete IEP goals. To order the Eden Autism Assessment and Curriculum Series, please call Outreach Services at 609.987.0099 x6010. The Eden Autism Curriculum is a comprehensive series of teaching programs designed to provide a valuable resource to enable professionals and parents to effectively teach students with autism. The Eden Autism Assessment and Curriculum Series reflects the collective experience of Eden faculty over the past four decades of providing comprehensive, individualized services to children and adults with autism. Employing a hands-on approach, the curriculum includes practical strategies for each teaching program. In addition, each skill area includes a systematic assessment and flow chart to support appropriate goal selection. Teaching programs are clearly written, with step-by-step instructions, and include target behaviors, prerequisite skills, criterion-referenced assessment, measurement, materials, procedures, and prompting techniques. These programs have been field tested with hundreds of students and adults with autism. Teaching programs are ground in the principles of Applied Behavior Analysis (ABA) and address essential skill areas such as cognitive, self-care and domestics, speech and language, vocational, physical education, recreation and leisure, employment, and residential living.